Grilled tomatoes are great as an appetizer, a nice vegetable side dish or just as a standalone dinner with bread and cheese. 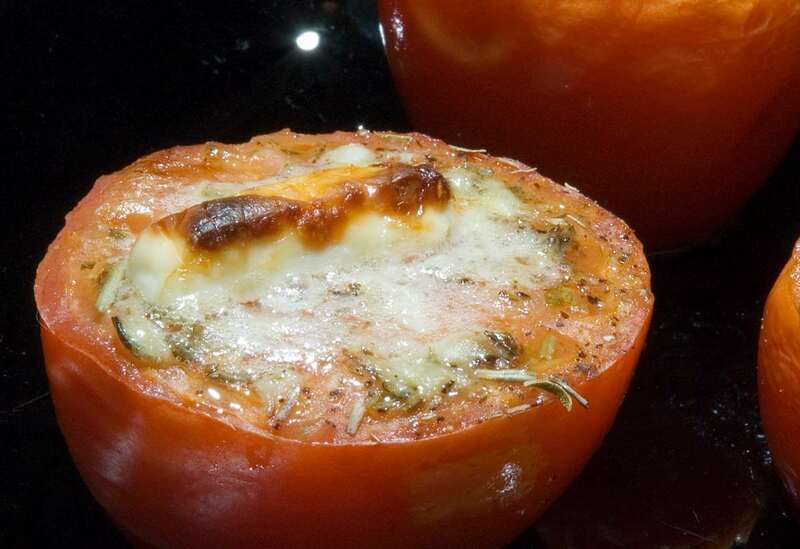 In this recipe, the tomatoes are topped with garlic, olive oil, herbs, butter and feta cheese and broiled. Cut tomatoes in half. Cut off a bit from both ends so that they don't tip over. Place on a buttered oven-proof pan or plate, large cut surface facing up. Combine garlic and salt in a mortar and grind into a smooth puree. Add olive oil and mix thoroughly. Top tomatoes with garlic puree. Sprinkle with herbs and pepper. Put a small piece of butter on top of each tomato half. Top with a slice of feta cheese. Broil under medium heat until the tomatoes start to soften, ca. 10-15 minutes. If the feta hasn't browned by then, finish under high heat until the cheese turns golden brown.